This is a low Price to Book based on the writings of David Dreman. He champions a contrarian investment approach based on interpreting market psychology and using value measures to pick stocks that are out of favour with the market. 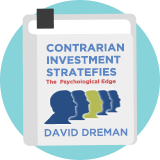 Dreman invests in out-of-favour stocks, often in out-of-favour industries, that he identifies using relatively straightforward metric criteria. "I buy stocks when they are battered. I am strict with my discipline. I always buy stocks with low price-earnings ratios, low price-to-book value ratios and higher-than-average yield. Academic studies have shown that a strategy of buying out-of-favor stocks with low P/E, price-to-book and price-to-cash flow ratios outperforms the market pretty consistently over long periods of time." Dreman warns that the Price to Book strategy in particular may lead to investing in loss-making stocks, at which one needs to be especially careful, and double-checking a company's financial strength is especially important.